Kingfisher Classic Hardwood Garden Love Seat. This classic patio love seat is beautifully made and will provide a lovely spot to enjoy a morning coffee or an evening glass of wine! We know that when buying online it's difficult to assess the quality of the item you're buying. Create a contemporary outdoor eating area for two with this Noodle Bistro 3-Piece Table and Chairs Set. Style: Bistro Set. Number of Chairs: 2. 5mm black screen printing tempered glass. Kingfisher FSLOVE Hardwood Love Seat - Wood Description Colour:Wood. Â |Â . Size:63x164.5x88.5 cm. Product Description. Kingfisher Outdoor Living Love Chair is the perfect piece furniture to help you make the most of the afternoon in the sun. This classic patio love seat is beautifully made and will provide a lovely spot to enjoy a morning coffee or an evening glass of wine. Manufactured from durable hardwood, this beautiful companion chair comprises of two armchairs joined by a two tier table with parasol hole in the middle. This furniture set comes with all fixing and fittings and tools included and is very simple to assemble with step by step instructions to help. Overall dimensions: H88.5cm x W164.5cm x D63cm. Box Contains. 1 x Loveseat set. Hardwood garden patio love seat. Two armchairs and an integral table with shelf and hole for parasol. Weather treated with all brass fittings. Simple and easy to assemble. Made from treated hardwood. 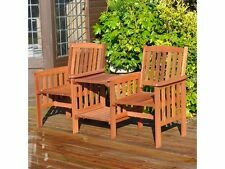 Kingfisher FSBTB 3 Piece Bistro Patio Garden Furniture Set- Multi Colour. 1 x Bistro Patio Garden Furniture Set Black, 3 Piece. Comfortable and durable. On very rare occasions we may have to use a 3rd party to help fulfill your order. Model Number : FSLOVE. Comprises two armchairs and an integral table. Hardwood garden patio love seat. Two armchairs and an integral table with shelf and hole for parasol. Weather treated with all brass fittings.